Thanksgiving is the day after tomorrow.. Ack! Are you ready? While I bought all of my food, I am not so sure I am ready for the big day yet. I want to go over the menu tonight, prepare some of the food tomorrow and make sure all of the tableware is clean and ready. I chose Kathe's gorgeous Thanksgiving Table as today's Feature of the Day, because it looks so warm and inviting. I love all the colors, and love her beautiful but simple decorations. 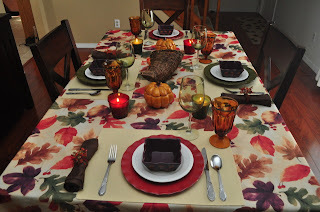 Be sure to stop by Kathe's blog at Kathe With an E to see all of the details of her decorated table here. Thank you so much for linking up Kathe! Thanks so much for featuring my table Pam :-) I can hardly wait to have family gathered around it!